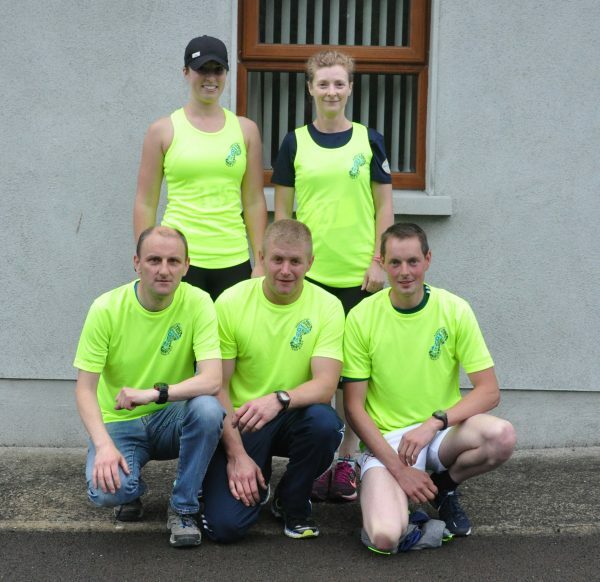 The rain that fell prior to the start of the third annual Borrisoleigh 5km on Thursday night last certainly didn’t dampen the mood of the quality field that lined up in quest of overall glory. 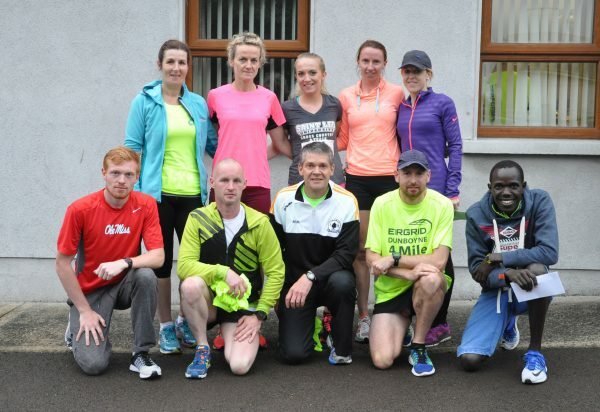 A five man break away led the colourful train of athletes down Pallas Street and as they approached the main Thurles/Nenagh road, it was obvious that the course record set by Clonmel’s Kevin Maunsell last year was no longer going to stand. 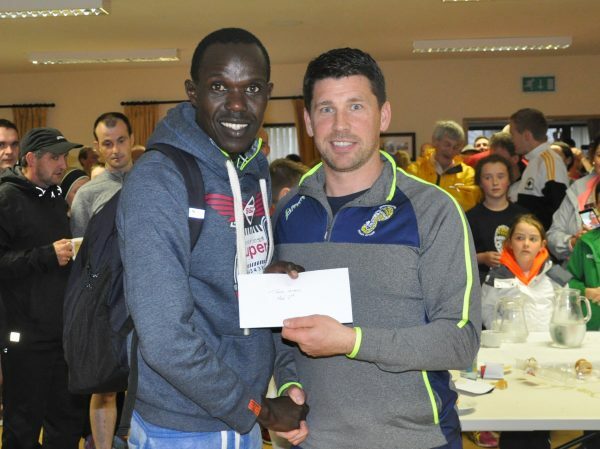 Maunsell was back to attempt to retain his title and he was joined at the head of proceedings by his club mate Sean Tobin, Kenyan Freddy Keron Stuk, Thurles Crokes athlete William Hughes and Dundrum’s in-form Kevin Moore. 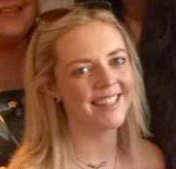 In close proximity to them was the leading woman, Siobhan O’Doherty. With 2km remaining, the lead was down to two. 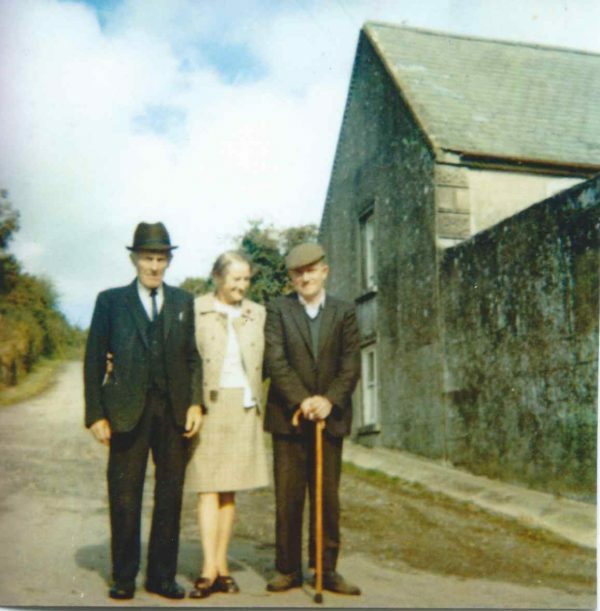 Sean Tobin, an American athletics scholarship student and Freddy Keron Stuk were shoulder to shoulder as they prepared to head back in the straight to Borrisoleigh. Both were throwing out feelers to each other to see if they could spot any apparent weakness but neither were willing to wilt. In one final bid to break free, it was the South Tipp man that upped the unrelenting pace and went for broke. 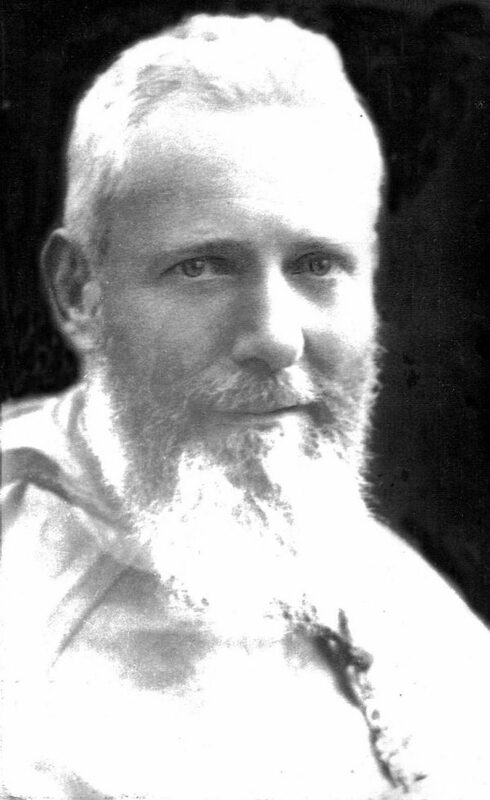 It proved to be the decisive and winning move and when he approached the finishing straight, those present glanced at the clocked and willed him to break the 15 minute barrier. This he did with 2 seconds to spare in what was a fitting end to a superb race. Freddy stopped the clock at 15:06 while the defending champion Kevin Maunsell came home in third in a time of 15:31. William Hughes ran a superb 15:40 to take fourth spot while Kevin Moore continued his brilliant recent form to break the tape in 15:46. Fresh from her superb performance at this year’s Dublin Women’s Mini Marathon, Siobhan O’Doherty came to claim a hat trick of title in Borrisoleigh and she duly did is highly impressive fashion. Her target was her own record of 17:07 and following another top class performance, the new record to chase is now 16:42. Another great supporter of the local athletics scene Margaret Danagher of the Templemore Club came home in second spot in a time of 18:48. Laura Tobin rounded off a great night for the Clonmel Club when climbing the third step of the podium thanks to a finishing time of 19:08. 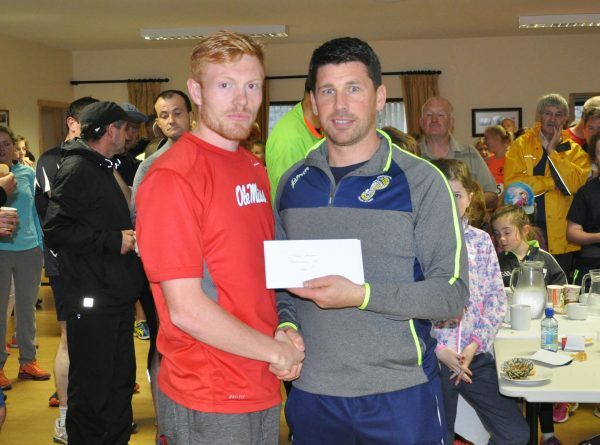 In the overage grades, Cyril Cuddy of the Portlaoise Club ran a superb 16:26 to take the over 40 men’s title. 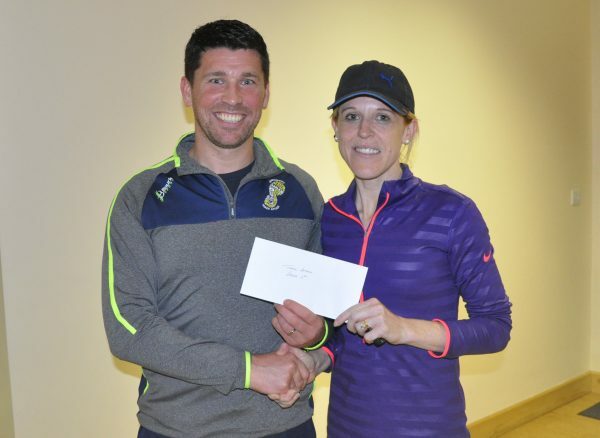 Michael Moore from Dundrum ducked under the 19 minute barrier with 2 seconds to spare to claim the over 50’s title while the evergreen Leslie Smyth from the Coolquill Club notched up the over 60’s title in a time of 21:50. An outstanding performance from St. Michael’s Monica Corcoran saw lay claim to the Over 40 women’s title in a hugely impressive time of 19:09. 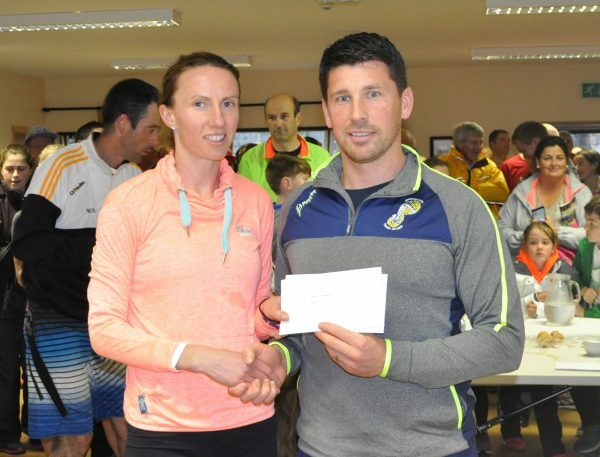 The over 50’s title went to local Track-Attacker Kathleen O’Meara in a time of 23:57 while the over 60’s title returned to nearby Upperchurch with Marion Gleeson in a time of 36:12. The king of the Track-Attackers is Michael Murray following his finishing time of 18:11 closely followed by Mike Gleeson in a time of 18:19. Austin Ryan made up the podium placings thanks to his finishing time of 18:41. Sinead O’Meara clocked a new PB of 21:50 to be the first female Track-Attacker followed in second place by Helen Kiely in 23:03 with Trish Ryan running a superb 23:54 to take the third spot. The junior Track-Attackers were also in superb form and here we had a grade for Primary School based members. In the boy’s grade, Cillian O’Brien was keeping his best performance of the year in cold storage waiting to unleash it at the most relevant time. Well that time came last Thursday night when his sprint finish down the straight resulted in the clock stopping at 22:44 to take the young Track-Attackers title. A further 6 second behind and in second spot was Tom Delaney while in third place in a time of 24 minutes flat was Mikey Kennedy. After clocking 34:14 in last year’s event, Kate Minogue showed what a winter of running can do when she brilliantly finished in a time of 29:11 to take the girls Track-Attackers title in what was one of the highlight performances of the night. 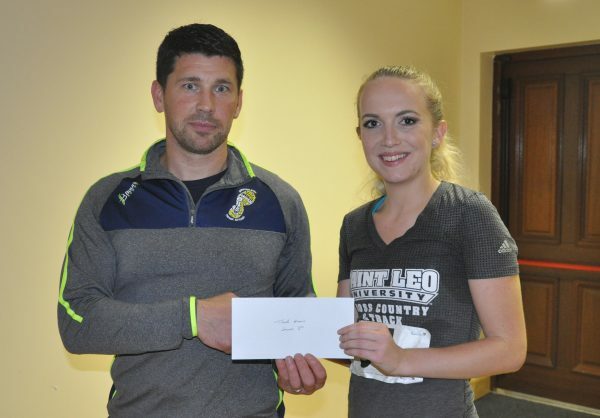 Second place on the night fell to Niamh Ryan. One of the striking highlights of the night was the standard of the women’s running. Often dwarfed in the background in terms of headlines and acknowledgement compared to their male counterparts, this certainly was not the case on Thursday night. The brilliant achievements of the top three are already noted but the noteworthy performances does not stop there. The top 7 women all clocked times in the sub 20 minute bracket. The top 13 all broke the 21 minute barrier while 19 women in total came home in under 22 minutes. On top of that, there were some outstanding performances right throughout the field. Track-Attack would like to thank everyone who came to support our race on Thursday night. Thanks to Betty Slattery and her team for taking the entries on the night. 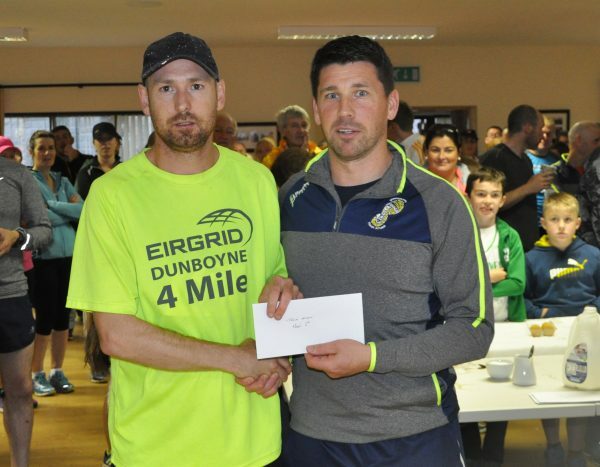 Thanks to Niall O’Sullivan for doing the chip timing. Thanks to Teresa Murray and her team for the brilliant job they did on the catering and of course thanks to everyone who provided the refreshments on the night. Thanks to Tom Mason and his team of stewards for ensuring the safety of all our participants and thanks also to Mark Stapleton and his team for organising the car parking at the GAA grounds. Thanks to Tom Tynan for his time in providing the lead bike for the event and thanks to Tara Kennedy and the Order of Malta for their help on the night also. Thanks to Christy Slattery, Michael O’Brien, Rena Ryan and George Ryan for their help on Monday night to ensure the course was ready for action. Overall we had a very successful event, the planning for the 2017 event has already begun. 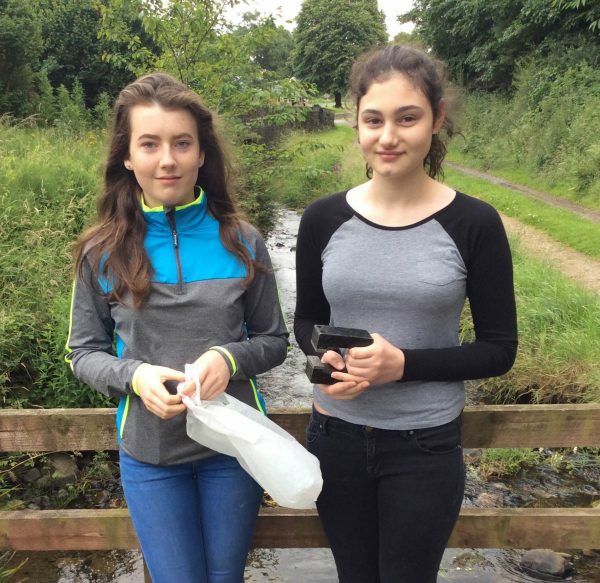 Hi, we are two 2nd year students, Laura Hutchinson and Antoinette Atik from St. Joseph’s College in Borrisoleigh. Last February we began looking at science fair projects. We both have a great interest in the sea and wanted to do something that would help pollution of our waterways. After walking around our lovely village, listening to reports on the news and reading many articles on how marine life are suffering we decided to do something about the quantity of plastic bags that end up in our waterways. This coincided with a European based competition called ‘Your ocean, Your future’. 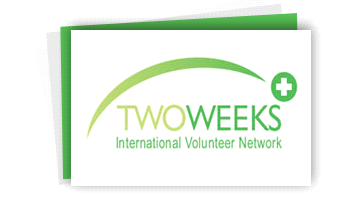 This was being funded by the Mario Ruivo prize foundation in conjunction with EurOcean. For this project, we had to submit a proposal of a unique idea on how we could save our oceans. This was the beginning of our project titled ‘Bags with Tags’. We worked on the project and even exhibited in SciFest in LIT Thurles. We even won a prize in our category. So what was our idea? With our aim to reduce the amount of plastic bags in the waterways we began to brainstorm how this could be done. Through a lot of research and trials we came up with an idea we felt was viable. Our idea is to make magnetic ‘tags’ which are attached inside the handles of plastic bags. These bags, if discarded in waterways, would be attracted to magnets that could be strategically placed along streams, rivers, estuaries etc. We were thrilled when we got through phase one of the competition. For phase 2, we then had to submit a proposal to a jury who deliberated and picked the best 3 entries from all over Europe. We made a video explaining how our project would work. This can be seen on our Facebook page – Bags with Tags. We were thrilled to hear this week that we are now one of the three European finalists in the EurOcean Competition for the Professor Mario Ruivo Prize! We will be given €1000 to carry out our project and to see if we can help pollution entering the seas! 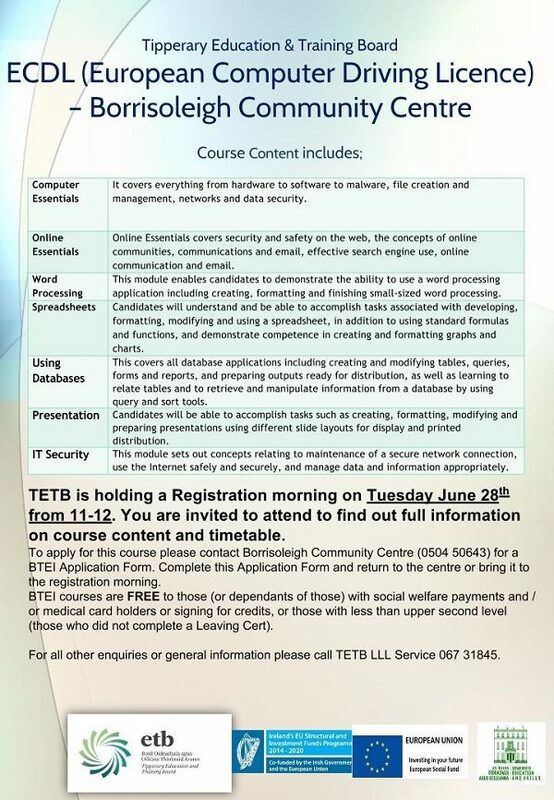 This is an amazing opportunity! We would like to say thank you to our science teacher, Mary Gorey for her help. We are working on the final stage of the competition now until October with the winners being picked in Europe in November! If you have any ideas on how we could save our oceans please get in touch via our Facebook page! 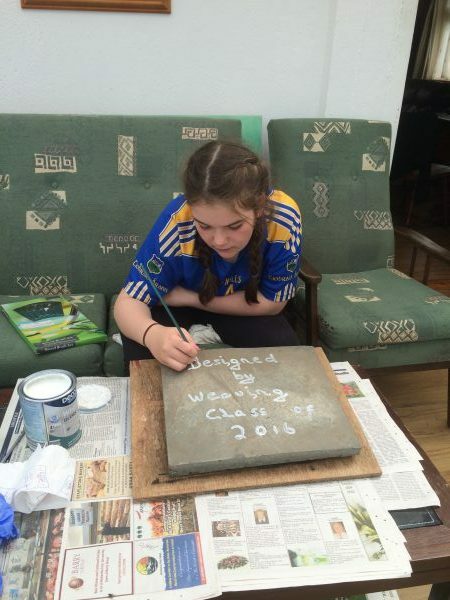 Pictured above is Anna Harkin who painted the inscription on to the plaque at the bottle bank for a project incorporating the work of weaving class 2016. Well done to everyone involved! !